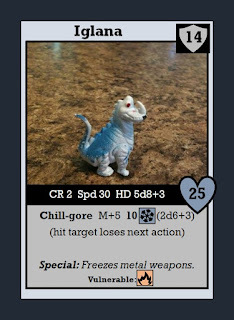 Here's my second entry for #MonsterMonday...another creature pulled from that iconic set of cheap plastic "dinosaurs" and commonly used in Undergroud Elemental Beastfighting. The rules below are for 5E (pretty much...I think I covered all of the really important stuff). 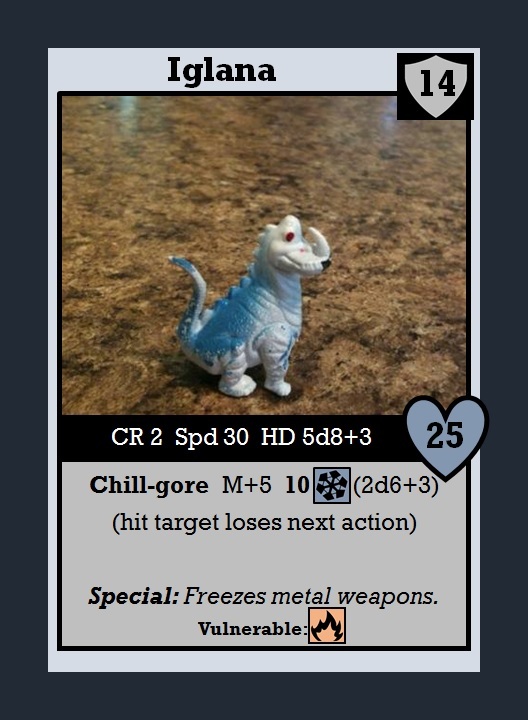 The Iglana is a fierce reptile imbued with cold elemental energies. It is usually found in frozen environments and seeks shelter for hibernation during warm seasons. It's not unusual for adventurers to encounter a family of 7-10 Iglanas in accessible underground areas. Iglanas stir easily while hibernating and are quick to return to full capabilities if they sense a threat. Iglanas are really cold! After hitting the Iglana with a metal weapon, the attacker must succeed on a DC 15 Constitution saving throw or drop the weapon. This effect may be mitigated by gloves or other insulation for the hands. I'll give the guy a try someday.